Dolphins are put on display all over the world and forced to live in conditions that do not allow them to truly thrive but recently some much worse issues are being brought to light. While some perform tricks, others are doing that and so much more. Photos have recently gone viral that were taken by the Movement to End Animal Circuses in Indonesia. This group is calling the government to outlaw dolphins being forced to perform in specific ways. The photos showed visitors at one location posing with dolphins that had been forced out of the water. These dolphins stayed out of water for several minutes which is something that can hurt them. Dolphins are forced out of the water so visitors can touch them. This action can injure the dolphins. Their delicate skin rubs against the rough floor surface and guardrail. The photos were taken on December 9 in Tangerang. Please stand with us in protesting against animal performances in Indonesia. There is still a lot of work to do. But we cannot afford to ignore what is going on around us. Change starts with small steps. We will never give up on animals. According to NYPost, these dolphins are forced to perform tricks in tiny pools filled with chlorinated water and at the end of each show they are loaded onto stretchers and packed into boxes to be transported to the next circus location. It is important to note that dolphins can literally go blind when forced into chlorinated water. These poor animals are being treated as if they are nothing and something needs to change. 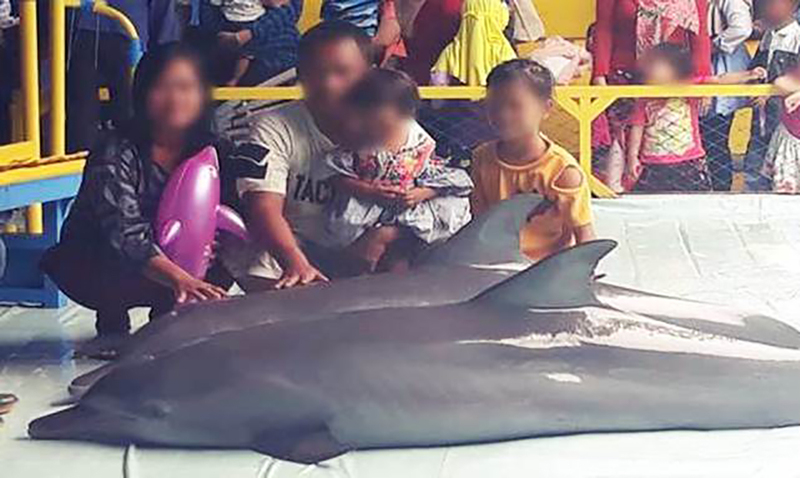 Dolphin cruelty is a serious issue in Indonesia, as well as cruelty to animals in general. For these beautiful creatures, life truly is hell. Dolphins are being commercialized all over the country and most are wild-caught. They are pulled from their lives in the wild and forced to live in conditions that do not even meet the smallest of their needs. Sadly, wild-caught dolphins are held under the most horrific of conditions in Indonesia. Forced to perform to blaring music in traveling shows, sometimes up to five times per day, they are forced to dwell in inside small and shallow plastic tanks. Subject to frequent moves in tiny containers of water, they spend hours on bumpy roads as they travel from village to village. If they die during transport, they are simply replaced. They truly are disposable dolphins. Circus owner Deny Karso is one such figure who uses loopholes in the law to keep dolphins captive for “research” or “rescue” purposes. It is all rubber stamped by the Forestry Department. On Bali alone, three companies are currently keeping dolphins in deplorable conditions. They are held in small, chlorinated, seaside pools where four animals, in particular, can jump and see the ocean. Forced to swim with tourists for food, their existence is a miserable one. In North Bali, a hotel keeps five dolphins confined for shows and swim-with programs. Near Serangan harbor, held in brackish, sewage-laden water, another facility houses dolphins in a floating pen in the sea. The businesses of wild tour operators in the Lovina area are under threat from these captive facilities. Even though tour operators do need to improve their procedures for viewing wild dolphins, these tours still remain the most responsible way for tourists wanting to view these marine mammals. This kind of thing should not be happening. They are not toys to be played with by children. They are living beings who deserve to be placed back where they belong in the world’s oceans.